This fun and quirky coat hanger from Ruddick Garden Gifts will make everyone smile. 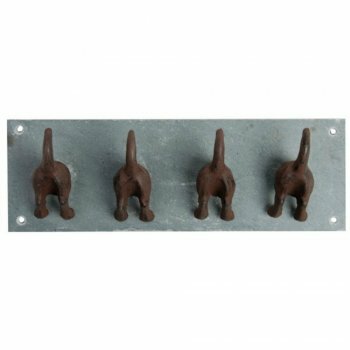 The four cast iron doggy tails have been mounted on a rectangular piece of grey slate and will look great in any home. The upturned doggy tails make the hooks perfect for coats and accessories but equally this would be ideal for dog leads or keys. This would make a fantastically funny yet practical gift for any dog lover.